This thrilling 2018 1 oz Silver Lunar Year of The Dog Coin is the latest release in the landmark Lunar Series II from the prominent Perth Mint featuring the newest “Year of the Dog” image. The Lunar Series I program was released in 1999 by the Perth Mint and it instantly gained tremendous popularity. The Lunar Series II started in 2008 with the “Year of the Mouse” release so the two coin programs overlapped during 2008 and 2010. The Lunar program is highly popular due to its high purity and impressive design, each year depicting the image of the Chinese Zodiac character. The 2018 issue presents the image of a dog and people born under this sign are considered as loyal, friendly, smart and honest. For this reason, this outstanding coin is a fantastic gift and a superb addition to any coin portfolio. Struck by the well-known Perth Mint. Offered in Brilliant Uncirculated Condition. Sold individually encapsulated. Multiples of 20 coins sold in a shrink wrap plastic roll. Bears a denomination of $1 AUD. 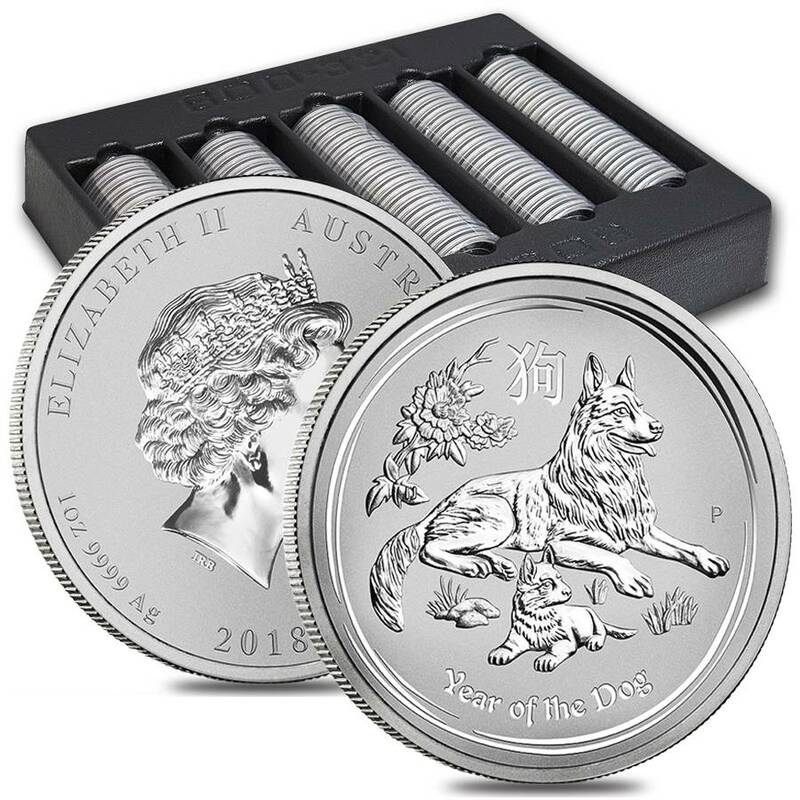 11th release in Perth Mint’s Lunar Series II. 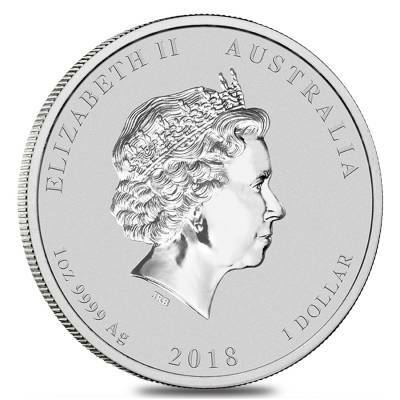 Australian legal tender coin backed by the Government. Obverse: Showcases the renowned effigy of Her Majesty Queen Elizabeth II designed in 1998 by Ian Rank-Broadley. 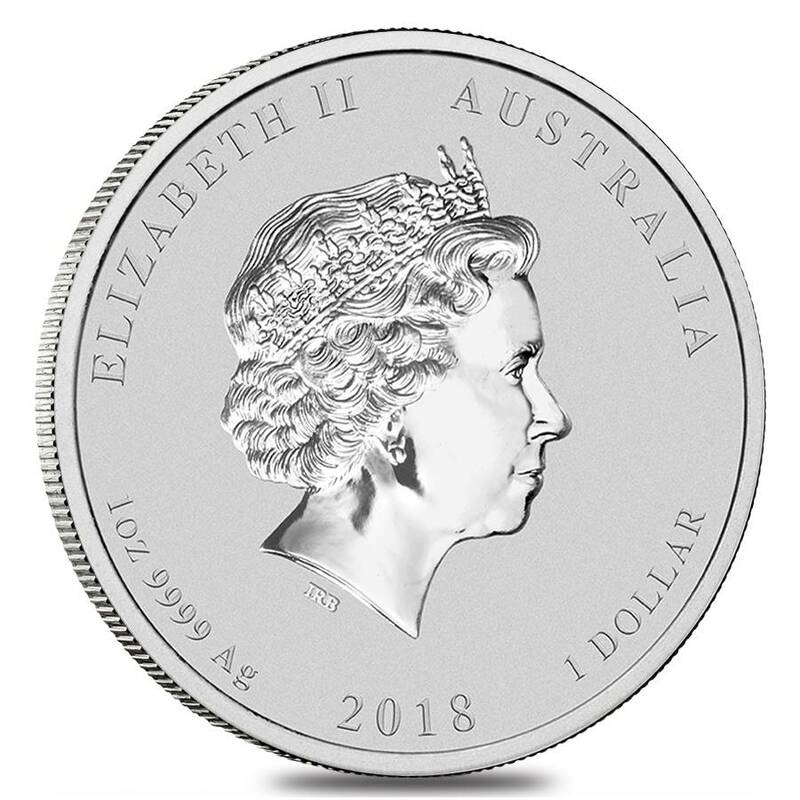 Inscriptions: “2018”, “Elizabeth II”, “Australia”, “1 Dollar”, and the purity and weight of the coin. Reverse: Features the newest “Year of the Dog” image. Engravings: “P” mintmark, “Year of the Dog” words, and the Chinese character for the word “Dog”. At Bullion Exchanges, you will find a wonderful selection of beautiful bullion coins produced by prestigious mints. 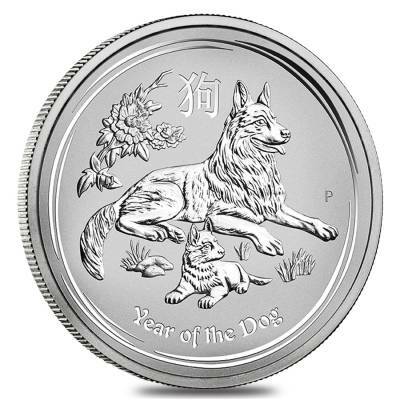 Add this exceptional 2018 1 oz Silver Lunar Year of The Dog Coin to your collection today, and it will be delicately packaged and delivered to your address in no time. If you have any questions, just call us at 800.852.6884, or message us, and we will be happy to assist you. Got the silver coin in BU condition as promised. Thank you! Bullion Exchanges always provides me with a great selection of products. Their prices are very good for bulk purchases. Always a pleasure to do business with! I came into the store but ended up ordering these coins online. thanks! This is such a great design. Thanks for pre-order availability, BE. Saw your post on facebook yesterday. Got a few Lunar coins for my family members as the Christmas gifts. Now cannot wait to receive them. Thank you, Be. I'm actually a repeat customer. I'm so mad that I didn't know about Bullion Exchanges sooner I would have saved a ton of money. Well, I found you guys now and I'm so glad I did. I've recommended you guys to all my friend's who invest in bullion. Thanks again! 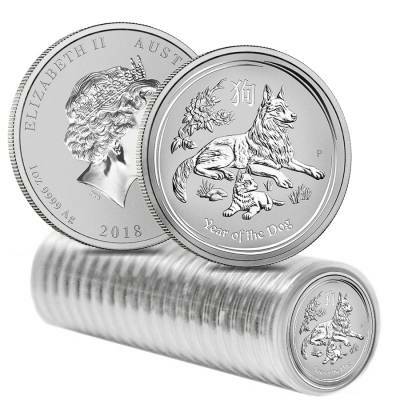 I love two things about this coin: attractive design and the recognized brand -Royal Mint, which is a true symbol of the highest bullion quality. Best price for the newest Perth Mint silver lunar coins! Looking forward to having these beautiful pieces as soon as I get notified about their availability. Thanks, BE! Great design! Want to buy a few for my collection and as gifts for my family. When will it be available? Will be sure to give you another 5-star review as soon as I get this shipment. Thanks for the great offer and look forward to buying more lunars from you once I get this first order. A great looking site as well can't believe I never found you guys before. thanks for offering this product on presale. Love the perth lunar series especially the year of the dog. Look forward to getting my mint sealed box of 100. You guys are the best!